We provide the personnel, process and equipment to guarantee the accuracy and integrity of your product at strategic transloading facilities. When you need to move sand, cement, and proppant, nothing gets in our way. FDF expanded its trucking business in 1992 by entering the frac transportation market. We continue to invest and follow our customers demands throughout north america. We have continued to satisfy our customers over the past 25 years. With the demands of hydraulic fracking, thousands of tons of frac sand are produced each year in the petroleum industry. FDF plays an important role in the supply chain. Our transloading facilities are designed to streamline operations and meet each customer’s specific requirements. 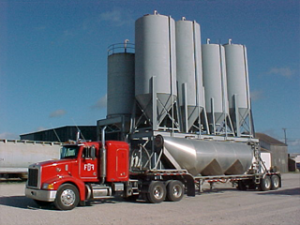 We solve frac sand inventory management challenges while maintaining government regulations and measuring accuracy. Our quality process involves instrumentation and belt scale solutions to quickly resolve your frac sand distribution needs. We continually look to upgrade our equipment and processes to meet and maintain customer demands. Rail companies have been pushing forward with some track expansion projects to accommodate the demand from this industry. Frac sand has gone from a 1 billion a year industry just 10 years ago and is expected to be worth nearly 20 billion by 2020. Contact us today if you require service in a remote area. We have partnered with many customers over the past 25 years and are always looking for opportunities to expand our transloading and rail footprint. We also offer dedicated trucks and work with your current contract drivers to eliminate logistic headaches.